We offer a latest range of Sports & Gym Flooring which is highly appealing and durable at the same time. Our flooring is available in various textures which is perfect to exercise upon. 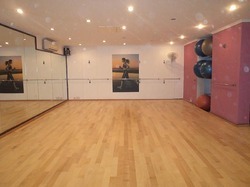 Further, the floor has a very high strength which protects the floor from dropped weights. We also have the capability to customize our services as per the clients' requirement.